Calling all art lovers, collectors, students and enthusiast! The Mamamayang Artistang Taga Antipolo (MATA) is inviting the public to witness the opening of the 4th One-Man Show Art Exhibit featuring the works of one of its member, artist Jose Rizalino S. Villan at Casa Divina in San Isidro, Antipolo City on May 5, 2013 (6:00 pm). The exhibit will be on display until May 15, 2013. Villan, a student of the great Ibarra Dela Rosa, the foremost exponent of meticulous impressionism in the Philippines, will showcase his oil and charcoal paintings mostly on rural life and nature. Most of his artworks were inspired by the things he grew up with from the green landscape of Sta. Barbara Iloilo to the busy streets of Quiapo and to his current abode in the ever captivating Antipolo. He has also invited other members of MATA and artist friends to bring an artwork or two to as a kind gesture of sharing the limelight to the people whom he have worked with for decades. Villan will make himself available at the art gallery during the 10-day run to personally answer queries from collectors, dealers, buyers and fellow artists. For more information about the event, interested parties may call 0923-5834740 or 0927-5854147. It was in 2007 that GanoiTouch Philippines, Inc., the authorized exclusive distributor of Gano Excel products in the country, was established. Thus far, its objective of achieving true excellence—both in world-class products and unmatched service to its thousands of customers provided by the company’s leaders—is well on track. The Chief Operating Officer of GanoiTouch Philippines, Inc., said that for the past 5 years, the company was relentless in pursuing excellence not just in the executive level and within the rank-and-file,but also distributors, leaders & product outlets. In order to achieve true excellence, GanoiTouch Philippines provides continuous training at all levels, from the new recruits up to the leaders, and even conducts training for personnel of official product outlets. He said that the strategy is to make all GanoiTouch empowered and independent as well. The past 5 years for GanoiTouch has also been a true test of the company’s stability. It also helped that the parent company, Gano Excel, is a hallmark of stability, which contributed in portraying GanoiTouch’s stature in the Philippine market as a solid and stable organization that Filipinos can rely upon in building not only their financialgoals but also mental and physical health through its superior ganodermalucidum-based products. Gano Excel, based in Malaysia, plants, manufactures, markets and distributes its wide range of products made ofganodermalucidum, a type of red mushroom touted to be better than ginseng, as its main component. At present, Gano Excel products are available in 65 countries, including the US, Canada and most parts of Europe and of course, the Philippines. Despite its success during the past 5 years, Esteves claims that challenges for the business remain. The fact that the company operates its business under a “multi-level marketing or MLM” strategy, commonly known as “networking,” remains one of them. However, he is not a bit worried. “GanoiTouch’s networking business is absolutely legitimate, fair and sustainable. We have never been complained about because we provide real and effective products that are proven around the world, and that’s a fact. In fact, I can see the company’s continued growth and become one of the top networking companies in the country,” he said. Among its most popular products among Filipinos are the PIOIR Coffee and Chocolate, the Tongkat Ali, Ganoderma and Excellium. He even hinted that Gano Excel is currently testing possible additions to its product lineup but declined to specify. Succeeding in the business is already in the horizon, according to Esteves, and counts on 3 factors—world-class quality products, a stable and successful global company that’s built to last and finally, a legitimate and fair business that’s sustainable for life. And to honor their most exemplary performers that contributed to the success of the company during their 5th anniversary, GanoiTouch Philippines, Inc. is throwing a glitzy and glamorous bash entitled “In Pursuit of True ‘Excel-lence: Faster, Higher, Stronger.” This 5th year celebration of GanoiTouch Philippines, Inc. will be held this coming March 23, 2013, 1 p.m., at the Aliw Theater located at the CCP Complex, Vicente Sotto Street, Pasay City. To make things even more exciting, a brand new Toyota Innova is up for grabs during the anniversary raffle. “This grand anniversary celebration is our way of saluting the leaders of GanoiTouch Philippines, Inc. for helping develop excellence not only in mind, body and soul, but also in health and in wealth. Our goal to enrich people’s lives and provide hope and economic stability through better health as provided by our superior products and legitimate income opportunity will definitely remain for the years to come,” explains Esteves. 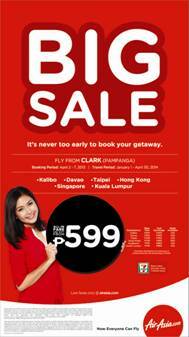 AirAsia Philippines' big seat sale is back!